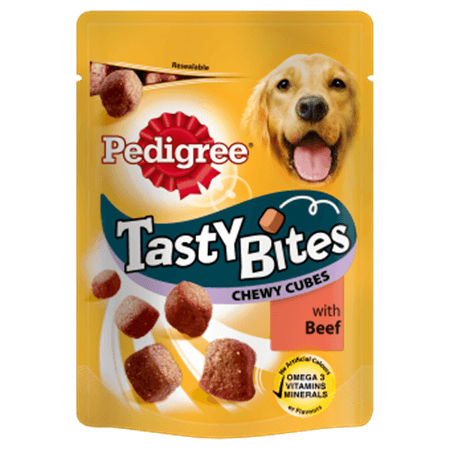 Dogs love to be rewarded - PEDIGREE® Tasty Bites are a range of scrumptiously tasty and meaty treats. The little bites are perfect to treat your dog whenever you want* and with added vitamins, minerals and Omega 3, you can feel good about it too! *Please be kind to their weight by following our feeding instructions. Chewy Cubes are moist and meaty chunks that are perfect for enjoying at any time! PEDIGREE®. Delicious treats, chews, meaty main meals and complete dry foods for all dogs. Toy dogs (2-3kg), feed up to 1 cube per day. Small dogs (4-9kg), feed up to 2 cubes per day. Medium dogs (10-15kg), feed up to 5 cubes per day. Medium-Large dogs (16-24kg), feed up to 7 cubes per day. Large dogs (25kg+), feed up to 10 cubes per day. Please reduce main meal accordingly.